The Best Chocolate Chip Cookies with Matcha Salt — Nourish Co. The half cake flour, half bread flour batter gives them the perfect fluffy-yet-chewy consistency. Only the best quality chocolate chips (over 60% cacao). These are a splurge, but amazing for a very special occasion. Sprinkle of sea salt on top. And the 12 hour + (up to 36 hours) of chilling the batter in the fridge magically makes it taste caramel-y. The longer the better, but they are still great if you don’t have time for this. Since then, I’ve made a giant version of these cookies every year for Bryan’s birthday (think Mrs. Fields throwback!) and for countless other life events for friends. Every time, at least two people ask me for the recipe 😊. One seasoning I’ve been really enjoying lately is matcha salt. It’s typically served as a dip alongside tempura, and just a hint of it creates an umami flavor bomb. So, as if these cookies couldn’t get any better, I’ve sprinkled matcha salt on them. Combine flours, baking soda, baking powder, and salt in a bowl. Whisk well. Using a mixer fitted with paddle attachment (or a hand-held mixer and bow) on medium-high speed, cream butter and sugars together until very light and fluffy. This took me about five minutes. Add the eggs, one at a time, mixing well after each addition. Mix in the vanilla. Scrape down the sides of the bowl with a rubber spatula. Reduce the mixer speed to low. Add 1/3 of the dry ingredients, and mix until just combined. Add another 1/3 and then another, until all of it has been incorporated. Scrape down the sides of the bowl with each addition. Pour in the chocolate chips and stir manually. When you’re ready to bake the cookies, remove the batter from the fridge to let it warm up and soften. Preheat oven to 350°F and line a baking sheet with parchment paper. Sift the matcha, then mix it with the sea salt in a small bowl. Bake the cookies until golden (but not brown! ), about 17 minutes. Transfer the cookies to a wire cooling rack to cool. RIGHT before serving, sprinkle on the matcha salt. 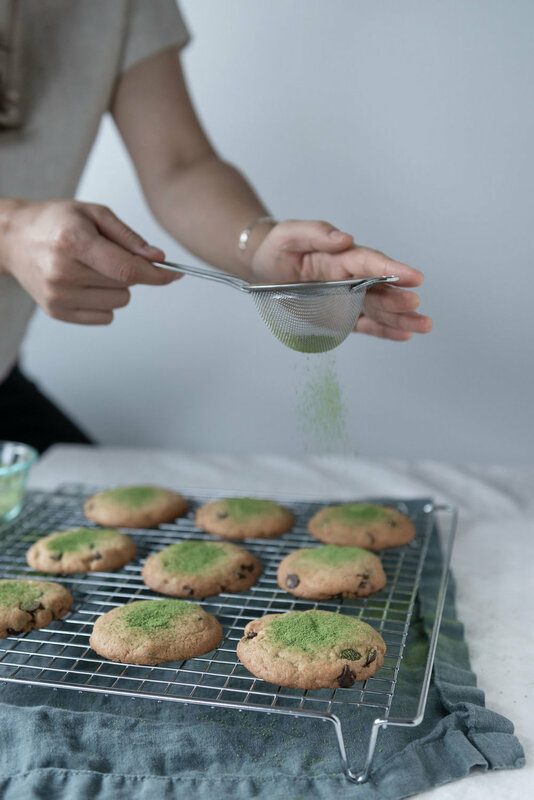 If the matcha salt sits on the cookies for too long, it will soak in the moisture from the cookie and not be as vibrantly green. This will also happen if the cookies are not sufficiently cool. Enjoy!